Yesterday afternoon I closed my laptop and went for a bike ride on the South Marshall Mesa trail. It was a beautiful day and the close proximity to the mountains and biking trails is one of my favorite things about Boulder. I’ve found jumping on a bike and getting away for a while is a great way to clear my head and reflect on life. Yesterday as I was riding my mind wandered to an historical event I discovered while I was preparing for my last Ignite talk. 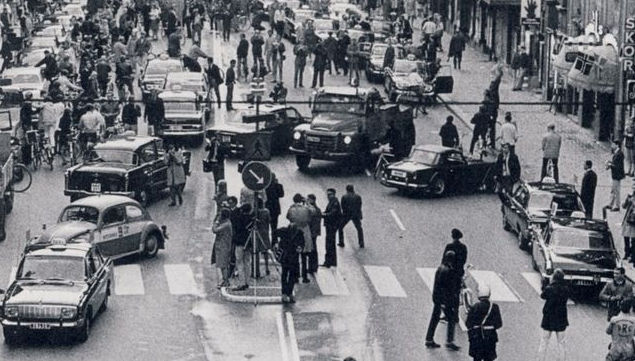 On September 3rd 1967, Sweden switched from driving on the left side of the road to driving on the right. The day when the transition took place was called Högertrafikomläggningen which means “the right-hand traffic diversion”. It is often referred to as Dagen H or simply H Day. The craziest part of this story to me was that during the transition, traffic accidents actually fell by 17%. In my Ignite talk I focused on the fact that we are more careful when things feel dangerous and that making something scary is actually one of the best ways to make something safe. But today I thought about Dagen H in a new way. Right now my life involves lots of big decisions and lots of change. But I doubt there will be many decisions in my life as drastic as having an entire country switch to driving on the opposite side of the road. I can imagine the struggle as the Swedish parliment delibererated on whether or not to make the switch. Every country around Sweden drove on the right and switching really was the most logical decision. On the other hand, switching required a ton of work and preperation and it’s not hard to envision what the negitive reprecusions could have been. The plan was also incredibly unpopular at the time. In spite of the risk and the effort involved, Sweden made the right decision. And it worked out for them. The lesson for me is that no matter how overwhelming a decision may seem, sometimes you just have to go for it, and trust that if you do the right thing, everything will work out in the end. When we first got accepted into TechStars, we planned on building an event registration system. Thankfully we had some awesome mentors who encouraged us to focus solely on social networking. They pointed out that there are plenty of other companies already in event registration and it would be really tough for us to compete with them. On the other hand, we had a decent chance of becoming the best in the world at providing online communities for conferences. We were a little hard-headed at first, but after Brad, David, Noah, Eric and Todd all gave us the same advice, we finally sat up and paid attention. We are really grateful to these guys because they saved us from wasting a lot of time this summer. Later this summer, Eric Norlin began pushing us to start thinking more like conference organizers. He kept asking “How are you going to decrease my cost or increase my revenue?” This time we listened. In fact, we decided to address his question head on. Now our entire revenue model is an answer to that question: We only get paid when we are successful in driving more registrations to a conference. I’m going to share a secret: Very little of EventVue was our idea. Instead we borrowed from the insight of dozens of conference organizers and mentors. That’s what entrepreneurship is all about. It’s learning to listen to the right people. One of the most important skills for any entrepreneur to learn to listen. “We don’t track anything. I couldn’t tell you how many people use our product”. What!?! Are you kidding me? Contrast this to another presenter that stood up and demonstrated that they knew their business inside and out. They knew everything about their customers – where they live, where they shop, what they like. They knew the size of their market and had a reasonable strategy for increasing their share of it. They knew their business model. They measured and evaluated everything. They knew exactly how much it cost to move their product into a new region and they knew how much revenue that would bring in. They had a mathematical justification for how much of a return you should expect from your investment. Which company would you trust with your money? Missed out on crucial eye contact that would have allowed him to connect to his audience and get instant feedback on what he was saying. If you get done with your pitch and someone has to ask you what you do, I doubt they’re going to give you any money. And yes, this really happened. I realized last night how important it is to pitch to people who know your industry and can understand your business. One of the presenters did a great job outlining their strategy, their competitive advantage and their knowledge of their business. The problem was that no one else in the room knew anything about their industry. They could be sitting on an amazing opportunity, but it wouldn’t matter. No one is going to invest in something they don’t understand. It pays to find people who get what you’re doing. Perhaps it’s inevitable anytime you get a bunch of smart people working together in one place. We live in a world where new opportunities abound and intelligent minds are overflowing with dreams of how to seize them. As an entrepreneur, you see the world, not as it is now, but how it could be. Everywhere you look, you see things that could be done better. There’s something in your nature that wants to jump at every opportunity you have. So you have a new idea, but unfortunately it doesn’t fit into your company vision. It’s just a good idea that you know you can execute. Perhaps it’s enticing you with the promise of quick results and easy money, or maybe it’s just more fun than what you’re working on now. Either way, you get caught up in the excitement and before long a new entity is born: aka, the side project. Over the weekend I had an idea for my own side project. It’s something that I have wanted to build for a long time and the release of the new Facebook API suddenly made it possible. I spent my day yesterday pursuing the idea, before coming to the conclusion that this isn’t the right time to be working on it. A big influence in this decision was the book Good to Great by Jim Collins. I went back and reread chapter 5 this morning. This time, the illustration about the fox and the hedgehog really hit home. I can’t afford to let anything (not even a great idea) take focus away from what we are really doing this summer. I know of several other teams at TechStars that working on side projects right now. That’s okay – your idea is probably more on target than mine was. My only challenge for you is to look at your goals and make sure your project is taking you closer to them instead of further away. You see, that’s the problem with side projects – they tend to distract us from what we first set out to do. They make us lose focus and we become scattered, diffused, and inconsistent in our vision. As Jim Collins said, it is better to know only one big thing than to know many things. Go find that one thing that you can be great at, and focus all of you attention on that.